Keep closer to the ocean with this watch from Hugo Boss, with a one minute bezel to mark the time and a comfortable black strap. The dial features large luminescent indices and a date aperture, with an impressive water resistance of up to 330ft making it a perfect option for swimming or holidays. 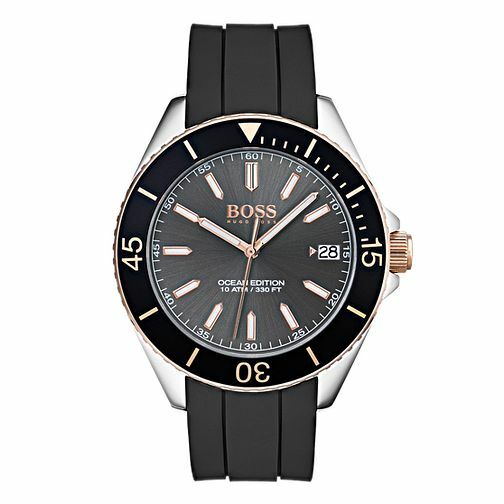 Hugo Boss Ocean Edition Men's Black Strap Watch is rated 5.0 out of 5 by 4. Rated 5 out of 5 by Anonymous from Watch looks great The watch is good looking, Sophisticated and is comfortable to wear. Rated 5 out of 5 by Anonymous from Hugo Boss Ocean Edition Watch The watch arrived in a matter of days very well packaged. The watch itself is of a high standard made with quality products. Not a divers watch but at the price a bargain.